"The CR-V Hybrid does not feature a gearbox, as the engine is mainly used as a generator." Declining diesel sales have led Honda to abandon the fuel for its all-new fifth generation CR-V.
David Hodgetts, the company’s UK managing director, said the new petrol hybrid engine in the CR-V is the “most important engine the company has launched in more than 10 years”. The new motor is expected to make up half of all CR-V sales in the UK. It is priced from £29,105 on-the-road. Using a 2.0-litre petrol engine and two electric motors, the powertrain setup in the CR-V Hybrid operates differently compared with most hybrids currently on sale. Power is delivered to the wheels by an electric motor almost all of the time. The engine is used to power a second generator, providing energy to keep the drive motor going. A battery allows for zero-emission driving over short distances and the engine can drive the wheels directly when it is more efficient. The concept is all about keeping the engine in its efficiency ‘sweet spot’. 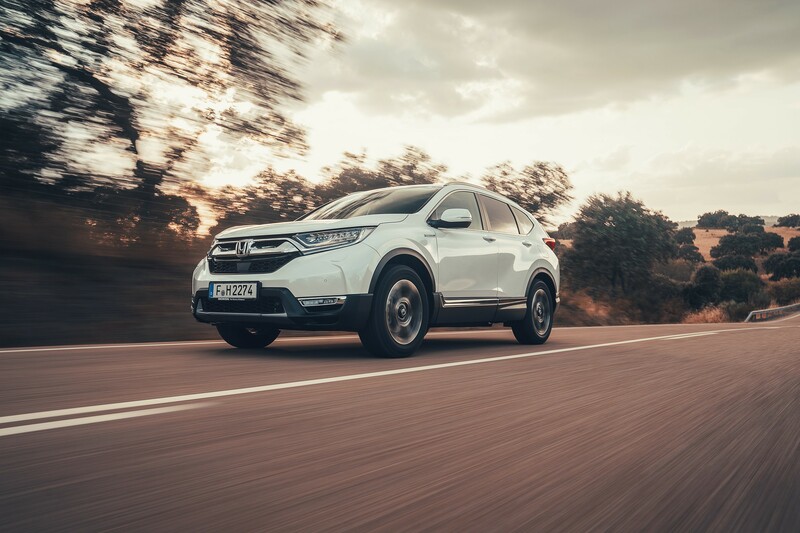 CO2 emissions for the CR-V Hybrid are measured at 120g/km for the front-wheel drive models and 126g/km for the all-wheel drive versions. 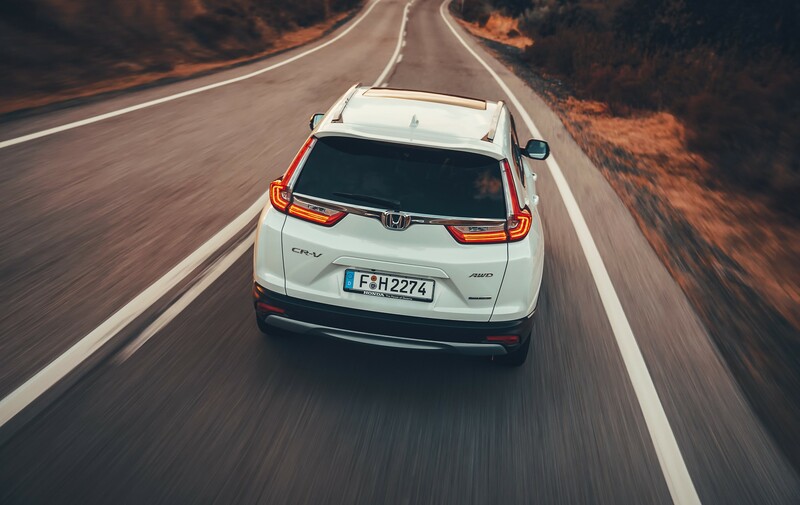 While not class-leading for a hybrid, they are significantly lower than the standard petrol CR-V.
Official combined fuel economy is rated at 53.3mpg. During our testing we found 42mpg to be more realistic. 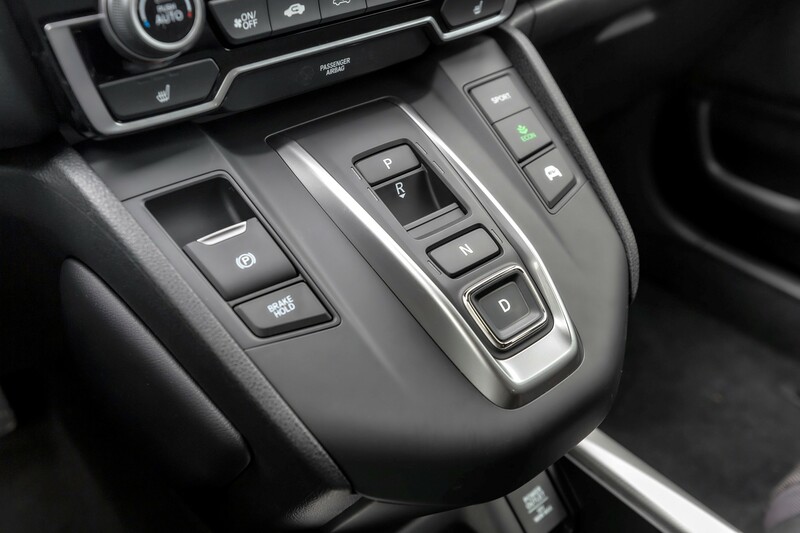 The CR-V Hybrid does not feature a gearbox, as the engine is mainly used as a generator. Although, at certain speeds a special clutch can connect the engine directly to the driveline. 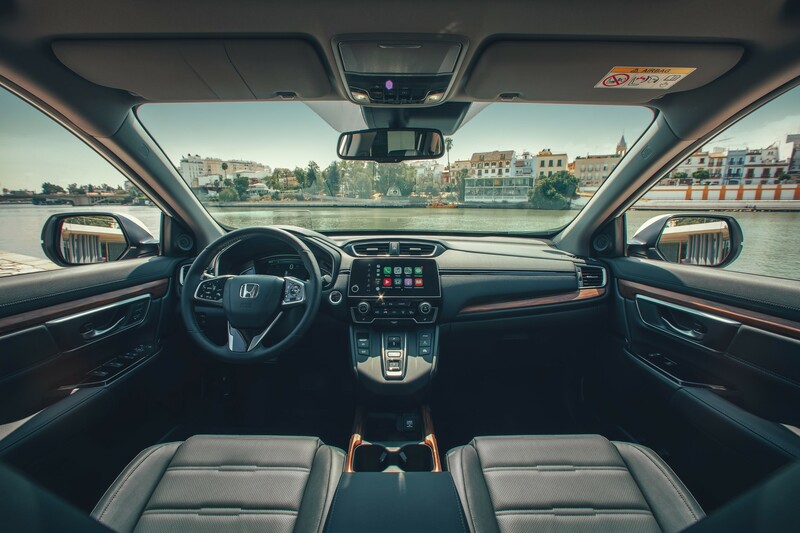 In order to provide a more typical feel and sound to the car, Honda has engineered the system to increase the engine speed as you accelerate. There are also steering wheel-mounted paddle shifters that activate the regeneration function, to simulate engine braking. The engine’s operation is fairly noticeable, it’s not too different to driving a CVT-equipped car – so expect a high-revving engine note when accelerating. Around town, the car does well to utilise its zero emission capability – with a maximum range of around 1.2 miles. When more power is needed, or the battery becomes depleted, the engine fires into life. It’s a clever system and allows company car drivers to experience a more powerful car with lower benefit-in-kind (BIK) payments. 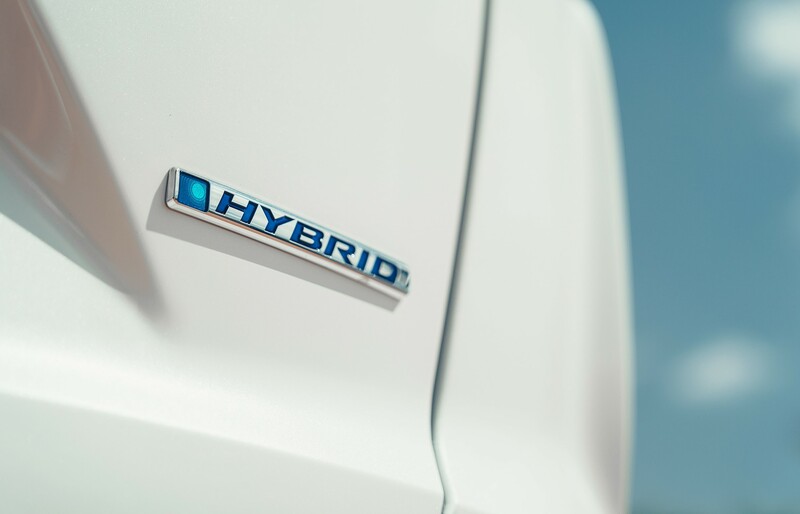 The CR-V Hybrid is available in S, SE, SR and EX grades. All models come equipped with a suite of safety technology as standard. Honda expects the range-topping EX model to be the most popular. 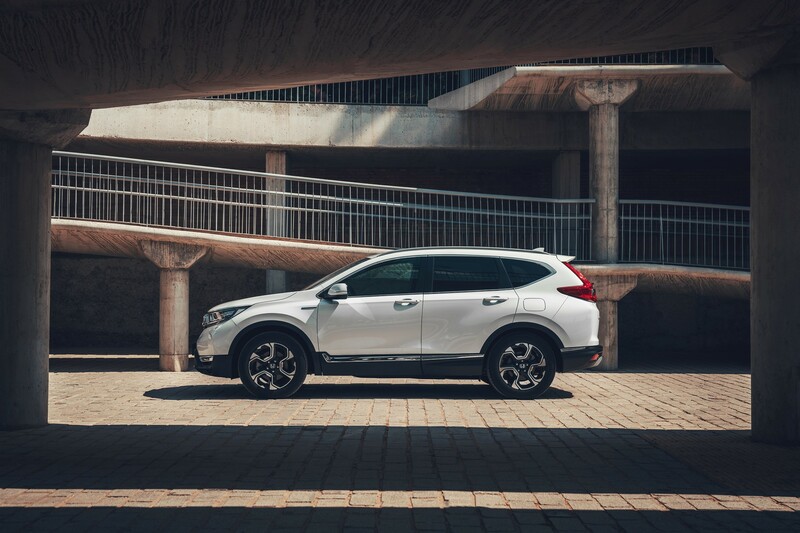 In developing the CR-V, the Japanese brand reduced chassis weight and increased rigidity to improve drivability. As a result, the CR-V drives well, has little body roll and a refined cabin. Interior quality is high with the only disappointment being the infotainment system, lifted from the Civic. It is dated and uses a smaller screen (seven inches) than most rivals. I am going to be a busy chap in February with the launch of (on paper) 3 similar mid sized auto SUV's to try and get my hands on for test drives before choosing one. All petrol, only 2 with 4wd, all below 130g/km. Shortlist: Honda CR-V Hybrid, Citroen C5 Aircross, Toyota RAV4 hybrid 2019. I thought you were sticking with the Mitsubishi Outlander PHEV. The new CR-V Hybrid is an amazing development and timely for Honda. I have to agree it’s mostly a decision between the CR-V Hybrid and Rav 4 Hybrid, not so sure on the Aircross, looks great, but RV’s may erode more than it’s lower front end cost. And real world MPG is the unknown at the moment. The only other thing to consider is towing. The Honda has a low 750kg towing limit which may impact is use for some people. Also adding a tow bar to the CR-V disables the wave your foot boot opening, For me the CR-V wins, based on historical Honda reliability and RV’s. I have scrapped the PHEV wish, what with the loss of subsidy and the company consider a shift from AFR's back to fuel cards it wouldn't work for me. Diesel is out, having run petrol/electric all diesels seem agricultural now. Comfort is a big consideration for me and the Citroen is as powerful 'automatic' as the Honda (albeit in 2wd instead of the Honda's 4wd), and it majors on comfort, as you say a bit cheaper too. Another strong wish list is adaptive cruise and lane keeping assistance and all 3 have these too. Having been powered by gear-free electric motors the last few years it puts the Honda in a clear lead desire wise due to its powertrain, electric motors are fantastic! I had a CR-V in the past and it was a very solid car, returned to lease company at over 100K still looking smart and driving nicely. No need for towing. Can't do much now until late Jan./Feb. when the demonstrators are around. And then our lease company probably won't get them on the quote system until August.......2020!